We have all seen pictures of distressed animals in laboratories. We have all read stories about activists getting radically militant. So what exactly is animal testing all about, and why is it legal in South Africa? By SHAUN SWINGLER. Dr Rob Smith isn’t talking about an illicit activity or criminal act. He’s talking about his legally sanctioned job. Smith is a pharmacological researcher who has spent the last two decades working in animal testing, an area whose emotional and perceptional minefields are clearly not lost on him. Animal testing is a legal requirement in South Africa. Once a substance has the potential to be prescribed for human use, it needs to be tested on animals first, from zinc ointments for dermatitis to gemcitabine for chemotherapy. This does not include cosmetics testing (animal testing for most cosmetics research is banned in the UK and most of the EU). 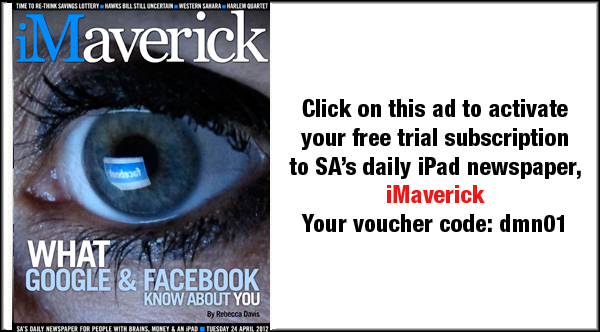 South Africa’s current medico-legal framework has animal testing at its centre. But images of suffering animals in deplorable conditions have come to define public perception on what this industry involves. Those images have fuelled a worldwide anti-animal testing movement powered by people who are ready to kill for their cause. Hailing from England, Smith came to South Africa to design and commission laboratories for the University of Cape Town. His two-year contract turned into six and a half years at the institution. He then took up a position at Stellenbosch University. There he acted as the vice-chair of the Animal Care and Use Committee. After nearly eight years at Stellenbosch, Smith left academia for industry. It’s difficult to quantify just how many animals are used in testing annually, but estimates run from tens of millions to hundreds of millions worldwide. In the UK alone, more than 3.7 million animals were used as test subjects in 2010. If the animal rights activists are to be believed, the animal testing industry is responsible for abominable violations of these creatures’ most fundamental rights. Animal research in South Africa has been criticised by Animal Rights Africa as being non-accountable, secretive and exploitative. Smith’s claims are supported by the NSPCA. The NSPCA’s 2011 annual report states that the Research Ethics Unit inspected a total of 38 research facilities during the year with 11 follow-up inspections, ensuring that all research institutes under the NSPCA’s supervision adhere to protocol and act responsibly. Smith explains that all university ethics committees are now registered with the department of health, providing national oversight to the testing industry and ensuring that all ethics committee personnel are appropriately trained and qualified. In December 2008, South Africa introduced a national standard from the SABS which outlines in detail the procedures for the use of animals for scientific purposes. Has Smith personally had any bad experiences with animal rights activists? “In the UK we had some problems when I was at a pharmaceutical company. At one stage we used to have weekly briefings from the police. They had an undercover operation with some of the activist groups. This was because the company was targeted on a fairly regular basis with letter bombs and petrol bombs, and the facilities were broken into and animals liberated. Smith says the constant barrage of threats made him think “seriously about whether or not it’s worth carrying on”. While his work life has been shaped by the prospect of violence, the nature of his job has also affected his personal life – and, inevitably perhaps, led to more than a few awkward moments at social occasions. Smith, a self-confessed animal lover, explains that he never developed an attachment to any of the animals he worked with. “It’s always been a job. [My animals at home are] pets. The animals I used to work with were ‘work’. It doesn’t mean that you treated them any differently. He doesn’t readily admit that he works in animal testing. The tight-lipped approach that many researchers adopt seems to serve as a survival mechanism for them and their families. It probably seems safest to put their heads down and stay out of trouble. Toni Brockhoven, public liaison for Beauty Without Cruelty, states, however, that BWC is “unaware of any researchers in South African being persecuted”. Smith is not outwardly critical of all animal rights groups. Smith argues that animal rights groups need to avoid blatant propaganda and violent tactics. The UK-based Animal Rights Militia (ARM), a splinter group of the Animal Liberation Front, does not have the same ideals in mind. Among numerous acts of aggression, the ARM is notorious for its 2006 attack which culminated in four of its members being jailed, two of them receiving sentences of 12 years each. For six years the group systematically terrorised a farm which bred guinea pigs for medical research. The campaign involved the use of letter bombs, death threats, destruction of property and, ultimately, grave robbing. Terrorism can be defined as an act of violence to further one’s ideological aims. While no one lost their life during this campaign, the fanaticism shown by these individuals is comparable to an act of terrorism. One could argue that their actions are hypocritical and are in stark contrast to their supposed goal of relieving the suffering of all sentient beings. While these groups believe their actions are justifiable, many do not view them favourably. In April 2009, Daniel Andreas, a militant animal rights activist, was placed on the FBI’s list of most-wanted terrorists for his part in the 2003 bombing of a California biotechnology lab. He is still on the run. Smith maintains that it is more constructive for animal rights activists to focus their energy on lobbying for changes to the current legislation and working to raise funds for replacements to animal testing. That way the medical research still gets done, and fewer animals are harmed in the process. Those who view animal testing as a necessary evil generally cling to the principle of the three Rs: reduction, replacement and refinement. Reduction focuses on testing methods which reduce the amount of animals used; replacement focuses on methods which find alternatives to the animal model; and refinement focuses on methods which aim to decrease the amount of pain, stress and discomfort animals feel during testing. According to Smith, along with lobbying for changes to the legislation, focusing efforts on the principle of the three Rs is key to creating a responsible and humane testing environment. But what about the “blatant propaganda”? It’s hard to look at pictures of these animals without feeling like you’ve witnessed gross violations of their rights. I still find it difficult to come to terms with this view. What about the claims of exploitation and maltreatment made by animal rights groups? Surely the stories of neglected lab animals that have resorted to self-mutilation and other harmful behaviours are not just another example of stories taken out of context? “That’s a welfare issue. It’s not so much of a problem with smaller animals: rats, mice guinea pigs, rabbits. It becomes more of a problem with larger animals, particularly with primates. They are intelligent, they have free will, and they can communicate in a similar way to humans so they need a lot more stimulation and care. There is a lot more responsibility involved with primates. And do some institutions or researchers not uphold this responsibility? “They try their damndest to uphold their responsibility, but they do not necessarily have the resources to provide the best environment.” Smith goes on to explain that primate testing facilities become significantly more expensive because they require more staff to provide support and enrichment to the animals. And this expense is sometimes one which certain institutions can’t afford. The image of a white-coated scientist forcing mascara into the red and watering eyes of a clearly terrified rabbit is one that has dominated the movement against animal testing. But Smith is quick to point out that this type of cosmetics testing – unlike the testing of medicines – is not legally necessary. And he clearly despises the idea that the quest for perfect skin or frizz-free hair can be used by the beauty industry to justify this stomach-turning abuse of animals. World Animals in Laboratories Day is held on 24 April each year. It’s an event aimed at raising the public’s awareness of the plight of millions of animals in labs around the world. I ask Smith whether he thinks these initiatives make a difference. There seems to be a small but active community of animal rights activists in South Africa. A quick Google search leads one to the Facebook page of the South African Animal Rights Activists Community. With nearly 3,500 “likes”, the group functions as a platform for activists to share information that promotes a vegetarian and vegan lifestyle, and to advertise events in line with the group’s ideals. One of these, organised by Beauty Without Cruelty, is set to coincide with World Animals in Laboratories Day. There will be a week dedicated to awareness-raising events in Cape Town, Johannesburg and Durban. This will include information stands, flashmobs, live bands, and even the opportunity to get the BWC logo permanently tattooed on your body for free – Brockhoven has already shown me hers. The animal rights movement in South Africa appears to be made up of a group of passionate, dedicated but ultimately peaceful individuals who have yet to adopt the radical and aggressive tactics of those abroad. These individuals embody the cause they are striving towards. Rather than planting car bombs and destroying property, they show dedication to their ideals through peaceful protest and stylised bunny tattoos. Perhaps there is a larger underlying issue at the heart of this ethical minefield. For members of the public to reach an informed opinion on animal testing they need to be provided with the facts and they need to be educated on what the current medico- legal framework requires. As Smith points out, however, scientists are not generally known for their public relations abilities. But amid the placards and protests, amid a public debate that is dominated by images of brutalised animals in tiny cages, would any animal testing researcher be brave enough to put their hand up and explain their rationale of law and science? 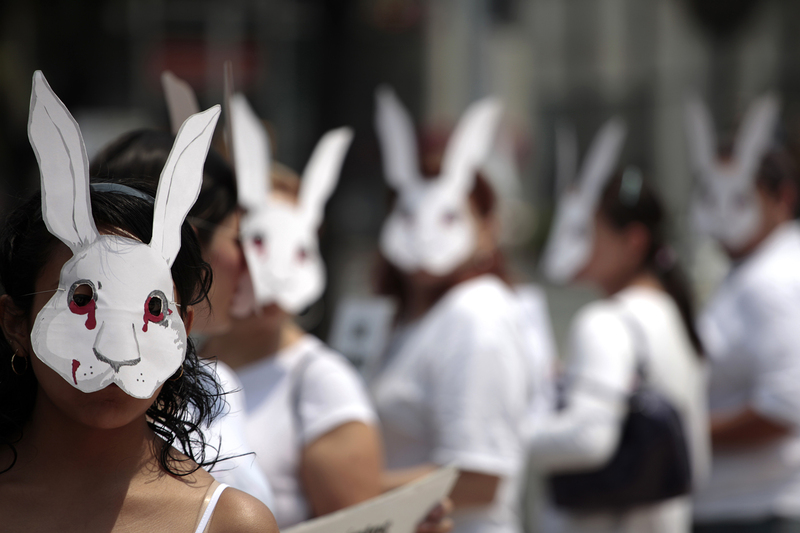 Photo: Activists from the animal rights group AnimaNaturalis wear rabbit masks as they protest against animal testing for cleaning products in Mexico City on 15 May 2011. REUTERS/Jorge Dan Lopez.